FDA rules warnings to be added to the labels of all commonly used anaesthetics: safety concerns for late pregnancy babies and children less than 3 years old. 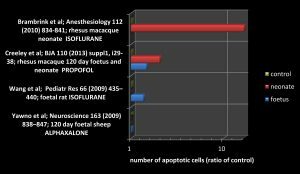 Figure 1: Comparison of anaesthetics in animal models of anaesthesia in early life: data from published literature on programmed cell death (apoptosis) in the brains of foetal and neonatal animals. A Safety Announcement by the United States Food and Drug Administration (FDA) issued on 14th December 2016 (click here to view) warned that repeated or lengthy use of general anaesthetic and sedation drugs during surgery or procedures in children younger than 3 years or in pregnant women may affect the development of childrens’ brains. This is a consequence of reports from animal research spanning 17 years and more recent human studies that conclude long term adverse effects on cognition and behaviour may be caused by anaesthesia and surgery, implicating all anaesthetic drugs in everyday use. They emphasised that recent human studies do suggest that a single, short exposure to general anesthetic and sedation drugs in infants or toddlers is unlikely to have negative effects on learning or behavioural development and this seems to be consistent with work in experimental animals. Although the FDA concluded that further research is needed to fully characterize this problem, they took the significant step of announcing that it now requires warnings to be added to the labels of general anesthetic and sedation drugs (including propofol, etomidate, midazolam, sevoflurane, desflurane and isoflurane (click to see List) so that the public may be better informed when making decisions regarding the timing of any elective procedures requiring anaesthesia in young children or pregnant women; weighing the benefits of the procedure against the possible risks of anaesthesia. Current research is directed either at determining the mechanisms involved with the brain damage or delineating the extent to which the animal research relates to humans; or even if it does at all . Allopregnanolone, a naturally occurring metabolite of progesterone, has anaesthetic properties by virtue of targeting the same mechanisms as propofol, sevoflurane etc BUT at the same time has the function of acting as a natural neuroprotective, shielding immature brains from damage and, further, controlling their normal development . One anaesthetic that has been used in humans, including children, babies and pregnant women in the past, alphaxalone (as Althesin), is closely related (an analogue) of allopregnanolone. Drawbridge has been able to show that the new formulation of alphaxalone, Phaxan™, has all the same anaesthetic properties as Althesin . So without doubt, we can say that Phaxan™ will be able to be used to anaesthetise all the same groups of subjects as Althesin, including children, babies and pregnant women. With these observations noted, and following the FDA announcement on 14th December, Drawbridge has decided to investigate by following up on these observations in the sheep model; the goal being to determine whether Phaxan™ could be the anaesthetic choice in future when young immature brains are at risk. These investigations will be a high priority in the development program for Phaxan™. Monagle et al; Anesth Analg. 121 (2015) 914-24.